Brace yourselves, Cleveland Cavaliers fans. The team has finally made an addition to the roster, someone who started his career as a No.2 overall draft pick. Sure sounds like LeBron James is getting the playmaker he asked for, right? Not necessarily. Said player is Derrick Williams, who was selected one pick after the Cavs nabbed Kyrie Irving in 2011. His career path hasn’t exactly mirrored that of the man picked ahead of him, as the Cavs will be Williams’ fifth team in six years. Where Irving is enjoying the riches of a max contract, Williams joins Cleveland on a ten-day deal. Underwhelmed? Of course you are, what with James being just two weeks removed from his publicly clamoring for more help. It’s tough to believe anyone from the front office presented this acquisition to him as an answer to his prayers. However, if you’re upset with the no-frills signing of Williams, practically insulted this was the team’s response to pleas for roster help, it’s likely you haven’t been paying attention to the Cavs lately. What’s happened in the games since James’ vocal demands proves that, no, there’s no need for any headline-stealing, blockbuster deal here. Cleveland is going to be just fine. Granted, things didn’t seem that way from the get-go. Following James’ heated comments, the Cavs put forth an ugly overtime loss against the Sacramento Kings. After winning their next two, they then fell at the hands of a woefully undermanned Dallas Mavericks team. From that point on, though, Cleveland has hardly looked like a team in need of a missing piece. The Cavs have won all four games since the Dallas debacle. They’ve topped 110 points in each victory, scoring more than 130 in their last two. Said contests came against the Washington Wizards and Indiana Pacers, two teams who’d been playing great basketball heading into their respective match-up with Cleveland. Does this four-game win streak mean the Cavs are fixed, that we can expect them to now steamroll their way to another championship? Not necessarily. At the very least, though, this week has proven Cleveland can beat anyone with its current roster, regardless of what was said a few weeks ago. When Cleveland started sputtering through January, it was an understandable gut reaction to say “this team needs a roster boost.” Only after taking a deeper look at what was causing the losses to pile up were you forced to reevaluate that thought. The Cavs were losing because their effort on defense, or lack thereof, was laughable. They were losing because the offensive ball movement slowed down significantly. Mental errors and noticeable boredom were prevalent in each defeat and, as a result, so were turnovers. Despite the demands for help and persistent trade rumors, it was clear these were not the kind of issues which get fixed externally. Sure, saying as much is tougher when the team looks like a disjointed mess on the court. However, look no further than how well the Cavs have played over the past four games to find proof cleaning up their own play was a far better solution than making desperate trades. This isn’t to say GM David Griffin can call it a day after signing Williams. A backup point guard is still needed, as rookie Kay Felder still hasn’t developed enough to effectively give Irving rest. At the same time, to say this team needs someone like Carmelo Anthony, or is doomed if it can’t pull off any sort of massive deadline deal, well, that’s been proven wrong. To say losing Matthew Dellavedova or Timofey Mozgov was detrimental to the roster is just as false, if not more. 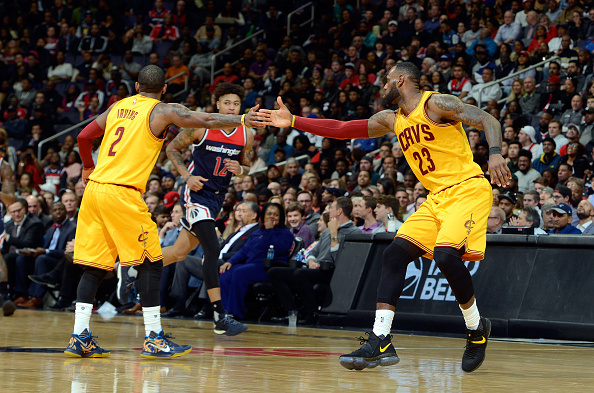 The Cavs, as currently built, can contend for a championship. How they’ve played in the past four games is a far clearer indication of what they can do than anything which happened during their tumultuous January.